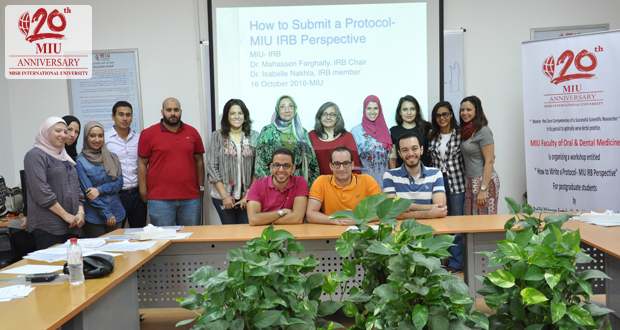 The Ethical Committee at the Faculty of Oral and Dental Medicine organized a workshop entitled “How to submit Research Protocol – MIU IRB perspectives” on Sunday 16th October, 2016. The workshop was conducted by Professor Dr. Mahassen Mohamed Farghaly, Head of the IRB Committee, and Dr. Isabelle Nakhla, Senior Research Scientist at The U.S. Naval Medical Research Unit No. 3 (NAMRU-3) and consultant of the committee. The target group was the second batch of post-graduate dental students and the aim was to inform as well as train them on the basics of writing and research protocols, taking into consideration the ethical guidelines used for conducting research. Thirteen students attended the workshop; 91.3% were satisfied with the course and the instructors.